Here is a recipe for a nutritious snack that has less oil and a lot of vegetables, and can be the idea snack for your kid! 1. Crush the Boiled Corn in a chopper. 2. Mix in a bowl and blend capsicum, chaat masala and chilly powder and keep aside. 3. Combine the potatoes in a bowl with cauliflower, corn flakes, corn flour, garlic paste, green chillies, salt, coriander powder and chilly powder and mix them well. 4. Now divide the mixture equally, make balls and flatten it to fill it with the stuffing. 5. Shape them in whatever contour you wish. 6. 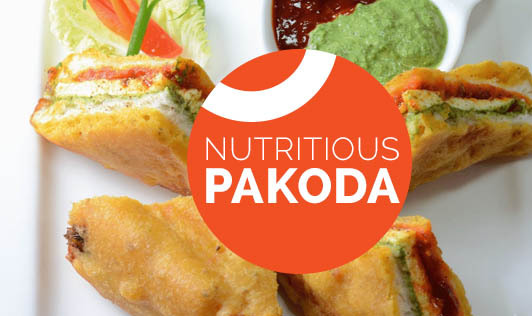 Now take semolina in a plate and wrap the pakoda in it. 7. Shallow fry until golden brown. 8. Garnish coriander and serve hot with tomato ketchup or cheese-dip.